Tom Collins says new Saints wing Andrew Kellaway is like a more elusive version of Jamie Elliott. Collins knows all about Australian ace Kellaway having played alongside him at Sydney side Randwick Greens. 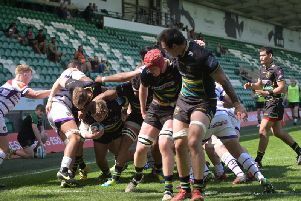 And he feels the 22-year-old has a strong resemblance to Elliott, who left Saints during the summer and has now joined Championship club Bedford Blues. “I played with Andrew Kellaway at Randwick so we know each other quite well,” Collins said. “It’s good to have him over. Kellaway arrived at Saints earlier this week following the conclusion of his commitments at Super Rugby side the Waratahs. Another summer signing, Taqele Naiyaravoro, has also finished his time with the Waratahs, but he has been given a break after playing a huge role in steering his former club into the Super Rugby semi-finals. Saints are looking forward to welcoming Naiyaravoro to England, with the wing’s performances on the other side of the globe whetting the appetite. “It’s not completely like for like, but he’s certainly similar to George North,” Collins said. “He’s going to be massive for us this year. Collins will be competing with Kellaway, Naiyaravoro and long-serving Saints players such as Ken Pisi. And he added: “We’ve got such strong depth in our squad and you need that to keep pushing players.